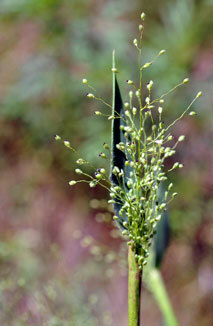 Also Called: Velvet panicum, velvet rosette grass. Culms: Solitary or few, erect or genticulate at base, stout, forming tufts, initially unbranched, becoming much-branched later in summer and autumn; nodes densely bearded with long hairs, broad glabrous or viscid-glandular band below each node, culm otherwise velvety pubescent. Blades: Lanceolate, 2 to 10 inches long, 1/4 to 4/5 inch wide, base rounded, surfaces grey velvety pubescent, tip tapering to sharp point; rosette dense, blades shorter, culm blades longer, narrower. Sheaths: Loose, sticky-glandular along middle of back, otherwise gray velvety pubescent. Ligules: Inconspicuous line or band of minute hairs. Inflorescences: Panicle,often shorter than blade, ovoid in outline, 2.4 to 6 inches; branches spreading to loosely ascending, mostly rebranched; secondary panicles reduced. Spikelets: Appearing long-stalked at ends of branches; obovate, .08 to .1 inch, softly pubescent, apiculate; first glume 1/4 to 5/8 as long as spikelet, broadly ovate, tip sharply pointed; second glume and lower lemma nearly equal, ca. as long as spikelet. Habitat: Moist sandy woods and low areas, roadsides, fallow fields, bottomland and upland prairies. Comments: Later in the growing season, the culms sprawl over surrounding vegetation, are much-branched and rebranched from the middle and upper nodes, and the blades are progressively reduced.